Monitor and Desk Mount specialist Mount-It! will change the way you work! 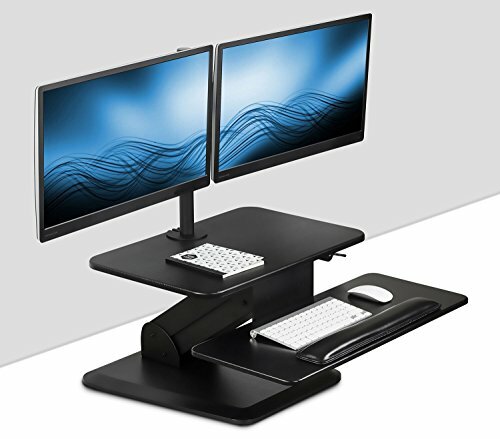 This sit-stand desk converter sits on top of your existing desk and allows you to work comfortably from either a sitting or standing position. MI-7914 provides you an easy, quick and affordable way to switch positions from sit to stand. Preventing you from sitting too long while working and allowing you to work under a most ergonomic standing position. Spring-assisted lift mechanism allows you to raise and lower it almost effortlessly in just seconds. MI-7914 gives you all the sturdiness and flexibility of Mount-It! products in a compact footprint. The desktop platform and keyboard tray are sized adequately to support laptops, keyboard and mouse side by side. The soft cushioning pad provides ergonomic comfort. We included a full motion dual monitor mount to allow users to further raise the height of their monitors and to provide more desktop space. The monitor mount is also height adjustable to allow full customization of the platform and monitor height to your needs. Using two monitors side by side will improve your productivity. Dimensions (Weighted Base): 19.5" x 19. 5"
Dimensions (Desktop): 23.5" x 15.75"
Dimensions (Keyboard Tray):26.75" x 11.75"
Extension Height: 6.5" to 18" from desktop.